The third temple we visited that day was Ditan (“Temple of Earth“) Park which is home to the Temple of Earth, one of the four “cosmological” temples of Beijing that each occupy one of the four compass directions: Temple of the Sun, in the east; Temple of Heaven, in the south; and Temple of Moon, in the west. The park is situated in the north, just beyond Anding (“Peace and Stability”) Gate of Beijing’s old, rectangular, wall-and-moat city, which, today, is additionally bounded on all sides by the 2nd Ring Road. The Temple of Earth was constructed in 1530 during the reign of the Jiajing Emperor, ex-Emperor Shizhong, of the Ming Dynasty. The Temple of Earth fell into disuse in the early 20th century but it reopened in 1925 during the Republic of China (1912-1949) period. All of the buildings of the Temple of Earth have distinctive engravings that depict dragons and phoenixes and which serve, in this context, as representations of the yin and the yang. 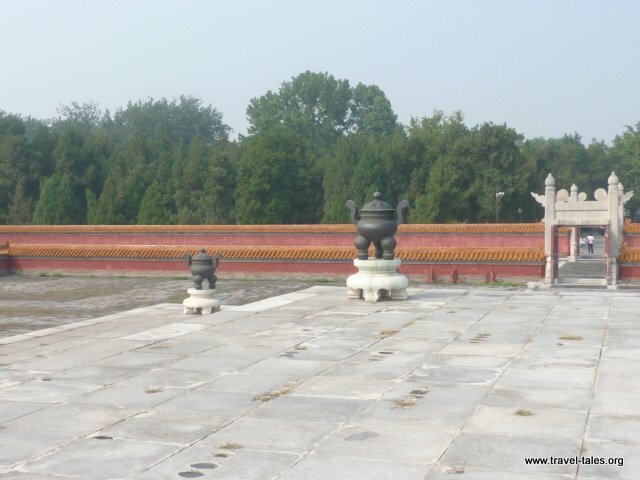 All of the structures within Temple of Earth Park were erected in accordance with ancient Chinese Taoist principles concerning the interaction of the 5 elements: earth, water, fire, metal, wood (the “cosmological” temples of Beijing are decidedly Taoist/ Daoist inspired). At the main entrance to the park is a tall stone archway in the facade-like style of stone archways throughout China. This type of archway is not designed to provide pathway access though a building, but is simply an impressive, towering, facade-like gate that marks an entrance (to my mind, the towering, facade-like stone archway is as quintessentially ancient Chinese as is the upturned eave!). Deeper within the temple complex is a sacrificial altar, Fangze Tan (“Square Altar”). Again, it is no coincidence that the altar is square, since this is the altar for performing sacrifices to the God of Earth, given that the symbol for the earth is a square. The raised, two-tiered platform of the altar is made of marble, each tier standing 2 meters in height. This post is the last extract of my mother’s travel journal written during a tour of China in 2013.